One major challenge for developing a 4D segmentation algorithm is the lack of available large set of ground truth that are defined for the whole cardiac frames and slices. 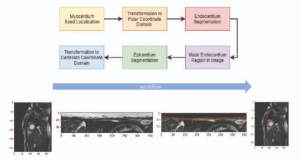 Initiated from the 2011 LV Segmentation Challenge that was held for the 2011 STACOM Workshop, we have started up a larger collaborative project to establish the ground truth or the consensus segmentation images for myocardium. The segmentation challenge is therefore set to open for new algorithms to participate. We aim to establish consensus segmentation images from a large set of data. We used modified STAPLE method to generate the consensus images from the contributing participants (raters). However, before the consensus images can be robustly established, we need a lot of participants, which are semi or fully automated segmentation methods. The more people join this work, the better the consensus images. Everybody can participate in this work, particularly for students and researchers in the field of fully automatic segmentation of the heart. Read carefully and agree on Terms & Conditions and CAP Data Use Agreement documents. Upon approval, you can download directly the data. Start working on the training dataset. You must only use the data for developing an semi or fully automated segmentation algorithm. When ready, submit binary mask images from the validation dataset. You will get results back in terms of performance metrics and you will also be able to download the consensus images from the validation dataset. This method involves manual drawing at the first frame before automatically tracks contour in the subsequent frames by minimizing energy functionals, which consist of optical flow and contour properties constraints. Submitted by the Nile University, Cairo, Egypt. Ahmed S. Fahmy, Ahmed O. Al-Agamy, and Ayman Khalifa, "Myocardial Segmentation Using Contour-Constrained Optical Flow Tracking", STACOM 2011, LNCS 7085, pp 120-128, Springer, 2012. 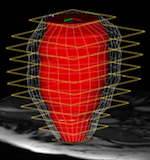 This is an expert-guided segmentation method where a finite element model of the LV was fitted interactively throughout the cardiac frames. Submitted by the University of Auckland, New Zealand. Bo Li, Yingmin Liu, Christopher J. Occleshaw, Brett R. Cowan, and Alistair A. Young, "In-line Automated Tracking for Ventricular Function With Magnetic Resonance Imaging", JACC: Cardiovascular Imaging, 3:8, pp 860-866, 2010. This method involves manual drawing at the first frame and the subsequent myocardial contours were detected by using the block-matching technique. 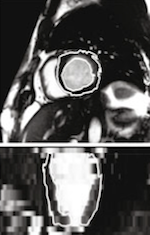 S. Ourselin, A. Roche, S. Prima, and N. Ayache, "Block Matching: A General Framework to Improve Robustness of Rigid Registration of Medical Images", MICCAI 2000, LNCS 1935, pp 557-566, Springer, 2000. This segmentation algorithm was based on two layers of spatio-temporal decision forests with almost no assumptions on the data nor explicitly specifying the segmentation rules. 4D spatio-temporal features to classification with decision forests were introduced in the first layer for context aware MR intensity standardization and image alignment. The second layer was then used for the final image segmentation. This is a fully automated segmentation algorithm without any user intervention. 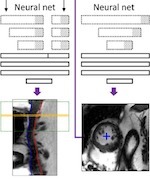 Ján Margeta, Ezequiel Geremia, Antonio Criminisi, and Nicholas Ayache, "Layered Spatio-temporal Forests for Left Ventricle Segmentation from 4D Cardiac MRI Data", STACOM 2011, LNCS 7085, pp 109-119, Springer, 2011. 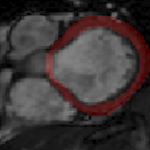 This fully automated algorithm registered and segmented cardiac MR images based on inverse consistency of deformable registration to register all frames to the first frame. The segmentation was applied to any frame and propagated to any other frames in the sequence through forward and backward deformation fields. Submitted by Siemens Corporation Research group. Marie-Pierre Jolly, Christoph Guetter, Xiaoguang Lu, Hui Xue, and Jens Guehring, "Automatic Segmentation of the Myocardium in Cine MR Images Using Deformable Registration", STACOM 2011, LNCS 7085, pp 98-108, 2011. This method was based on a 15 layers of Convolutional Neural Network (CNN) for segmentation. The network was trained for a pixel-wise labelling. Code is available from a github page. Submitted by the Booz Allen Hamilton, USA. Phi Vu Tran, "A Fully Convolutional Neural Network for Cardiac Segmentation in Short-Axis MRI", arXiv:1604.00494 [cs.CV], 2017. This method was based on Convolutional Neural Network (CNN) regression by utilising the radial distance of the LV walls to segment the myocardium. 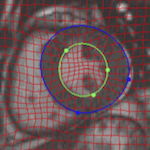 Two CNNs were used: 1) a network to detect the centre of the ventricular cavity point, and 2) a network to determine the radial distances from the centre point. Submitted by the University of Malaya, Malaysia. Li Kuo Tan, Yih Miin Liew, EinlyLim, and Robert A. McLaughlin, "Convolutional neural network regression for short-axis left ventricle segmentation in cardiac cine MR sequences", Medical Image Analysis, 39, pp 78-86, 2017. This fully automated segmentation algorithm was based on the global control of a statistical deformable model with local control assumption of the material properties of non-rigid objects. The initial 3D model was estimated using a Histogram of Oriented Gradients. Non-rigid motion was reconstructed using a variational method. Submitted by the University of California in Los Angeles, USA. Sharath K Gopal, "Unified Deterministic/Statistical Deformable Models for Cardiac Image Analysis", PhD Thesis Dissertation, UCLA, 2016. A fully automated cardiac segmentation based on a modified dense fully convolutional neural network (DFCN). The network was also used for cardiac disease classification, participated in the STACOM 2017's Automated Cardiac Diagnosis Challenge. Submitted by the Indian Institute of Technology, Madras, India. 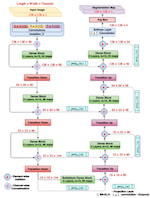 Mahendra Khened, Varghese Alex Kollerathu, and Ganapathy Krishnamurthi, "Fully Convolutional Multi-scale Residual DenseNets for Cardiac Segmentation and Automated Cardiac Diagnosis using Ensemble of Classifiers", arXiv:1801.05173, 2018. 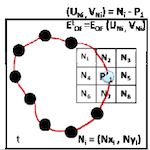 Our method is mainly based on fully convolutional densenet which proposed by Simon Jégou. The differences are only three down-sampling layers are used, and the number of feature-maps are significantly cut down by reducing the growth rate of dense block. Submitted by Capital Normal University, China. The segmentation method was based on the use of an encoder-decoder Convolutional Neural Network (CNN) followed by the use of Long Short-Term Memory (LSTM) network in polar coordinates.